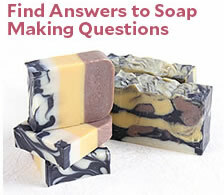 Q: Do you have any tips for working with problem fragrance oils in cold-process soap? (1) I take one ounce (basically equal amounts of fragrance oil to fixed oil) liquid oil OUT of my main recipe and heat it up to 100 degrees. Then, I add my fragrance into this oil. This simply dilutes the fragrance oil’s initial “Hey! I’m so strong that I’m going to just throw your batch into a tailspin!” power. (2) I add the oil/fragrance mixture at thin, thin trace. Rather than adding the fragrance at a thick trace, I add it at the first sign of thin trace. Do not mistake false trace for thin trace; simply add the fragrance/oil sooner than usual. (3) I always hand stir the fragrance/oil mixture in with a fork/ladle and never, ever use a hand blender for problem oils. (4) Raise your temperatures to about 110 to 115 degrees. This will help to keep your mixture more liquid than at a lower temperature. Q: Could you please explain what a flashpoint is? A: A flashpoint is the lowest temperature at which the vapor of a combustible liquid can be made to ignite momentarily in air when given a spark or open flame source. It lets us know the maximum safe storage/work temperature for substance. Q: I used the melt and pour method but the soap is stuck in the molds and I cannot get it out! What did I do wrong? Help! A: I’m not sure how long you’ve left your soap in the molds, but it takes about 12 hours until the soap is really ready to release. Many times, it’s hard but is still sticky and cannot be released very easily. Remember, it’s cheaper to let the soap sit in the mold than it is to break the mold by wrenching it! If it’s been a couple of days and you still can’t get the soap out, put the soap and the mold in the freezer for fifteen minutes. I don’t normally use the freezer because getting the soap very cold can contribute to glycerin dew (similar to the condensation that forms on a glass just taken from the fridge) and also makes the plastic mold more brittle. However, by getting the soap cold, it will slightly shrink the soap and it may help to get the soap out of the mold. Q: I’m a new soap maker and recently left pounds of glycerin melt and pour and shea butter melt and pour in my car trunk, which of course made for frozen soap. Is there anything I can do about this? A: Oooooh man, I hate that. Are you doing individual soap bars? If so, no need to panic. You MIGHT get slightly sweaty soap after heating/molding but no major harm. You might notice a little bit of trouble with layers adhering together as well. If you’re doing loaves and need to cut, that’s a much much tougher proposition. The soap tends to ‘sheer’ and break when it gets frozen. The crystalline structure doesn’t come back together easily. Water is not your best bet. Liquid Glycerin at 3-5% would be a better choice but if there’s any way to be able to just use individual molds, that is your best bet.of course made for frozen soap. Is there anything I can do about this? Q: I had some really pretty blackberry seeds that I sprinkled on top of some CP Blackberry Sage soap …after the soap heated up and gelled, most of the seeds had sunk into the top of the soap and are now dark and icky. A: I’m sorry that your soap did not turn out as planned. The good news is that it’s still useable soap – just not as pretty as you wanted. We do herbs on top of soap pretty regularly. What we’ve found is that the following tips help to ensure that the herbs stay on the top of the soap, out of the caustic formula, and sometimes, they even stay the right color! 1. Pour your soap at a thick trace. By thick, I mean pudding-like. 2. Once the soap is poured, tap the mold onto the counter several times to release any hidden air pockets. 3. Sprinkle your seeds/petals on top of the soap. 4. With gloves on, gently smoosh the seeds/petals into the soap. 5. Cover gently (if you normally cover your soap) and allow it to gel phase/not gel phase/whatever you normally do. If the trace is super thick, it should hold and suspend whatever seed or herb you toss onto the surface of the soap. So long as the herb stays out of the soap, it has a much better chance of staying a lovely color. Q: Does Beeswax make CP soap harder? A: Yes, beeswax will help to make cold process (CP) soap harder but it also inhibits lather, speeds of trace and causes the soap to get hotter in the mold (potentially helping to flash off essential oils and make them not as potent in the final bar). I recommend using beeswax at no more than 0.5 oz per pound of soap though you could go up to a full 1 oz. Pre melt the beeswax and add it in at thin trace. And yes, you can handmill soap that had beeswax added to it. Q: What would cause a batch of soap to erupt while in the soap mold? A: Boiling inside sounds like a normal, very impressive gel phase. We had some really great volcano soap that made a beautiful tunnel when we finally cut into it. My gel phases normally get to about 180º so I’m surprised yours stayed so low! Did you switch lavender essential oils? I normally find that my lavender does the opposite – and actually decreases the temperature of the overall batch. Q: Can you make good quality soap using the cold method without palm oil i.e. is there an environmentally sound alternative to using palm? A: You can use any types of oils you want. You could do a 100% Olive Oil soap or a 75% Olive Oil 25% Coconut Oil or really any number of combinations. Palm is not necessary to make a good bar of soap, though it does contribute to lather and hardness. Q: Can anyone give me a melt and pour soap recipe for a soap thats good for psoriasis/eczema? This soap will be moisturizing and gentle to the skin and will be low in lather because of the oil additives. Q: 1. What will make cold process soaps freeze or set up too soon? 2. Can cold process soaps be molded into different shapes? A: Cold Process soaps will accelerate trace and set up quickly for a variety of reasons, from temperature (too low) to choice of oils (too many solid oils) to fragrance oil (fragrance accelerates trace). Depending on what the factors are in your recipe, I could help you pinpoint it to one of those things and give you some tips for how to slow down trace and make your soaps easier to work with. Yes, you can pour cold process soap into different molds. You probably cannot actually mold the soap and use it like a clay or putty but you could definitely use Milky Way Molds or Flex Molds for CP Soap. Q: I made a batch of lotion using beeswax, but the oil and water separates. Is there any way to save my lotion? A: You are experiencing separation of your lotion because oil and water do not naturally mix. You need something called an “emulsifier” to help blend and bind the oil and water together. Emulsifiers are non-natural substances that are a waxy consistency and are used at 1 – 5% in your total lotion recipe to help keep your waters and oils together and make a smooth creamy mixture. My favorite is just the very basic Emulsifying Wax NF. I normally use it at about 3% with Stearic Acid as a secondary help. You can purchase emulsifying wax here. That should help your lotion making endeavors considerably! Q: I am looking for cold process natural dog soap recipe that will be good for dry skin. Can you help? I have searched the internet, and cannot find one. Depending on the size of your batch, quantities of water and lye will vary. Consult the Lye Calculator to help determine quantities. Most dog recipes that I’ve seen tend to also have Litsea or Lemongrass EO in them, as well as a wee bit of Tea Tree Essential Oil for its antibacterial properties. Q: I seem to be having trouble with some scents dissipating from my soap after just a few weeks, particularly citrus essential oils. I read a lot of internet chat about “anchoring” to make the scent last longer. Can you tell me what I can use to anchor lemon, lime, orange, & mango please. I would love to have a strong lemon soap. A: Citrus Essential Oils (EOs) are very volatile and tend to dissipate quickly. Anchoring is a fairly common term that is used to refer to blending a heavier, deeper, “stickier” scent with the fragrance you wish to hold onto. 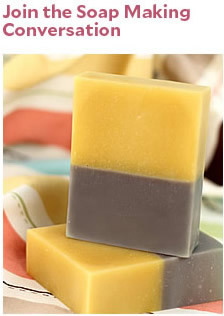 The heavier scent usually will help the lighter scent stick in your soap or toiletry recipe for longer. I have fairly good luck with Lemon, Lime and Orange when I anchor them with Litsea and Lemongrass. As for Mango, you might try another brand of Mango because there are some that definitely stick in soap fairly well. Either that, or try blending the Mango with another orange fruit such as Tangerine or a synthetic orange fragrance that is designed to stick in soap. Q: I am making soaps with a number of natural additives and I am worried about shelf life. I realized that I couldn’t use certain botanicals like mint or lavender because they turn brown. Just because the botanics turn brown doesn’t mean that they are “bad” or rotten. You can use them still, even if they go brown. Poppy seeds, white rice, ground oatmeal and other dried products such as coffee grounds that *don’t* spoil if they are sitting out on your counter. I’m not sure about fruit fiber as I’m not familiar with that product. Sunflower seeds should not have actually turned your soap bad; could the seeds have been bleeding color? I would highly recommend that before you sell your product in areas that you cannot monitor, such as the out of state client, that you make very scientific notes (batch, batch date, recipe, humidity, temperature) about the changes in weeks 1, 2, 4, 6, 12 and 24 so you can determine what the actual additives do with your particular blend of oils and fats. Your additives will react differently depending on the actual recipe used and can vary from recipe to recipe which is why I would highly recommend testing, keeping notes and really be through and accurate about your batch measurements. If you’re starting up a business with just soap, you might consider adding some liquid soap or lotion base without going through all the testing that you’re having to do with the soaping. There are quite a few bases that you might consider. I personally like these Beeswax Lotion and the Liquid Organic Soap Bases. You can use both essential oils and fragrance oils in cold process soap. If you’re using fragrance oils, make sure that they are skin safe (so no candle or potpourri fragrances) and ideally, if they’ve been tested in cold process soap, that will save you some trouble. If you’re using essential oils, just make sure that they’re not cut with anything. Some of the diluents can be trouble in CP soap. Regarding your orange essential oil, it is difficult to get straight Orange EO to come through in CP soap. It’s just one of those essential oils that are fleeting (like many of the citrus ones, actually). If you anchor it with a Patchouli or even a Litsea, that will help its staying power. In terms of usage rates, they are somewhat all over the map. I generally start with .5 ounces of fragrance or essential oil per pound of fats/oils and then go up or down from there. Some lighter fragrances, like Vanilla or Jasmine, for example, I’ll use a full .7-.9 ounces per pound but some very potent fragrances (anything with cinnamon notes or mints), I’ll end up with .2 ounces per pound so it does vary somewhat based on the fragrance or essential oil. If you start at .5 oz. per pound, it’s a good bet that you’ll get a decent fragrance. Q: I’ve made some bath bombs, but I must be doing something wrong…when dry, they have lots of cracks all over them…please help! A: Bath bombs can be tricky; luckily, it sounds like you are following all the right steps. I would just make sure you are packing the bath bombs REALLY WELL! I have found this to be the ultimate secret for hard, long-lasting bath bombs. When I have a bath bomb that crumbles beyond repair, I put the crumbs in a jar or plastic bag and have Fizzing Bath Sprinkles! What does your citric acid look like? We had some customers that were using a coarse grade citric acid and they were having problems with the bath fizzies sticking together. With a coarse citric acid, I have found that using equal parts baking soda and citric acid works better than my normal recipe (2 parts baking soda and 1 part citric acid). I hope these ideas help! Q: How can you calculate the SAP value of cooking oil and Vegetable cooking oil? or there is a rule of thumb in determining how much lye to use? Are these oils good for the skin in general? A: No, you cannot calculate the SAP value for either vegetable shortening or generic cooking oil because the ratios of different oils in the cooking and vegetable oils vary based on the brand. No, there is no general rule of thumb for determining lye amounts. You must figure out lye amounts based on the specific recipe you are using. Here is a good online lye calculator. Q: I made a Goat’s milk soap and after 24 hours, the block of soap had a pool of what looked like olive oil sitting on the top of it. I mopped it up and proceeded to cut the bars for drying. Each bar is oozing oil. What would be your first thought as to what could have caused it? A: You can mop the oil up and then make sure you do a pH lye test to make sure the lye isn’t too heavy. The soap will most likely be okay with curing. I’m actually guessing either the fragrance oil was the culprit and caused your soap to have some trouble, or the soap didn’t reach a full trace. If the soap doesn’t reach a full trace, it can partially separate in the molds. Cure the soap and then make sure you pH test it to check to see if it’s too lye heavy before using it. Q: Is there an easy formula to decide the pounds of soap a recipe will make? I always assume about a 15-20% shrinkage over 3 months with the water so initially, you’ll get (26 oz. / 4 oz. =) 6.5 bars of 4 ounce soap. This soap will probably shrink about 15-20% over 3 months or so. Thus, you’ll be left with 6.5 bars of 3.4 ounce soap when all is said and done. Q: What kind of conditions does CP soap need to cure after it is removed from mold? I know the process takes from 4 to 12 weeks but I cannot find out what temperature it needs to be kept at? A: You’ll want normal room temperature. Unheated buildings tend to not allow the soap to cure properly. It doesn’t need to be warm (as in oven warm), just room temperature. You’ll want to make sure that the area is dry and not humid. Additionally, make sure that there is plenty of air flow around your soap so it is allowed to breathe. Q: What colorants do you recommend for a solid bubble bath recipe using glycerin, baking soda, cream of tartar and SLS? Q: What type of base oil or cream would be good for the under eye area and can you use essential oils that close to your eyes? A: I use straight Tamanu Oil mixed with Jojoba Oil on my eyes; it’s awesome! Of course, it’s expensive but you really don’t use much. You can use Lavender Essential Oil, Carrot Seed Essential Oil and German Chamomile Essential Oil in very small concentrations but I would stay away from most others. They will sting and you would need to wash and rinse the eye out if you got it in your eye, as you would with any product you get in your eye, but will not harm the eyes if used at .5% concentrations or less. The Carrot Seed EO and the Lavender EO are what I’m currently using in my eye concentrations. I use the German Chamomile on my anti-redness (aka blemish) formula. Q: I just got my super cool new wooden log mold for cold process soapmaking and I cannot figure out how to line it. Can you help? A: Lining your mold is a matter of making sure that you keep your wax paper flat so there are as few wrinkles as possible and also fully lining the mold so there is no accidental leaking that will cause your soap to stick to the mold. A: Bath bombs can be tricky; luckily, it sounds like you are following all the right steps. I would just make sure you are packing the bath bombs REALLY WELL! I have found this to be the ultimate secret for hard, long-lasting bath bombs. When I have a bath bomb that crumbles beyond repair, I put the crumbs in a jar or plastic bag and have Fizzing Bath Sprinkles! What does your citric acid look like? We had some customers that were using a coarse grade citric acid and they were having problems with the bath fizzies sticking together. With a coarse citric acid, I have found that using equal parts baking soda and citric acid works better than my normal recipe (2 parts baking soda and 1 part citric acid). I hope these ideas help! Also, be sure to check out our Bath Bomb Tutorials. Q: Is it okay to use my large pot for cooking after using it for CP soapmaking if I prewash it and then run it through the dishwasher? A: I would recommend having separate pots for soapmaking and for cooking, just to be on the safe side. That said, many people use their pots for cooking as well. Until you can get another pot for soapmaking I recommend washing your pot thoroughly by hand and then washing it again in the dishwasher. You may be able to find cheap stainless steel pots at a second hand store that you would only use for your soapmaking. Q: I would like to know if most recipes are showing oils measured in weight ounces or in fluid ounces? A: Thanks for your note. Most recipes are done in weight. If neither is indicated, you’ll want to go with weight and weigh out your ingredients on an accurate scale. All cold process recipes should done with weight. It’s more accurate that way because of the discrepancy between weight and volume measurements. Q: Is it possible to use baby oil as one of the oils in a soap recipe or does it have to be plant based to work? A: Baby oil is made from mineral oil and fragrance. Mineral oil doesn’t saponify, so it should not be used as a soapmaking oil. You may want to check out this site http://www.millersoap.com. She has a large amount of information on oils that can be used in soap. Not all soaps are made exclusively of vegetable oils, tallow is a common ingredient in soapmaking also. Q: My question is about using goats milk in soap. If I were to first add Titanium Dioxide to my oils, then add the lye/goatsmilk mixture, would this produce a white bar of soap? Could I then swirl in other colors? A: If you first add titanium dioxide to your oils, and then the lye/milk mixture this will produce a more white bar. It may not be totally white and may actually be more of a light ivory but the titanium dioxide will help to lighten up the overall look of the soap. Yes, you could swirl with other colors if you lightened up the look of the soap. It would help to get a more true base color (so you’re not trying to overcome the yellow color that the goatsmilk gives the soap). Q: What about Essential oils? When can you use them in your soap? I love Rosemary and would like to use it in soap. A: Yes, you can use essential oils in soap. The usage rate varies but the general rule of thumb is .5 oz. of essential oil per pound of soap. You can use more or less according to your preference. If in doubt, make a small test batch. Q: When mixing scents, how can you tell what can be mixed with what? A: When mixing scents, the easiest thing to do is take the lids off the scents that you’re thinking of blending and simply smelling them side by side, together. This will give you a good idea of what the scent will smell like blended. If you like that, the next thing to do is take a dropper and drop a bit of each scent on a paper towel. Let that mix sit for a few hours and then come back and smell it. If it still smells good, make a small test batch of soap to try and wait for full cure before pronouncing the blend good (or bad). Q: I have been selling my lotions, etc. for about 2 years now and have always used lotion bases that I buy from different companies. Is it still necessary to add a preservative such as Germaben to these mixtures? I thought they already have a preservative in them. Also, I am about to try to make some cold process soap. Is there anything I am supposed to add to this as a preservative. I haven’t been able to find anything concrete about this. If nothing is added, how long before a bar of soap becomes rancid, or does the soap become rancid? A: If the lotion base that you’re using has preservative in it, then you do not need to add a preservative. Make sure that the pre-made base already has the preservative in there before foregoing it, however! You do not have to use any sort of preservative in CP soap. Some people choose to use an anti oxidant (such as Vitamin E) to help prevent rancidity in the oils and spoilage but it’s an optional thing and isn’t necessary. The shelf life of the soap varies based on what oils go into the recipe and the superfat, but the basic rule of thumb is that a well balanced bar of soap will last for a minimum of a year (if not longer).